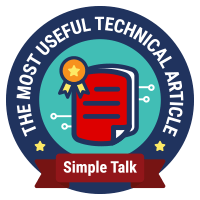 It's taken a few posts to get here but finally we have arrived at the point in my blog series on Continuous Delivery with TFS / VSTS where we actually get to start using TFS or VSTS -- depending on the route you choose to go down. The main focus of this post is on getting up-and-running with these tools but it's worth talking a bit first about the merits of each platform. TFS is Microsoft's on premises ALM platform. It needs planning, provisioning of servers, and care and feeding when it's in production. With TFS you are in complete control and -- disasters not withstanding -- all data stays in your network. VSTS on the other hand is Microsoft's hosted ALM platform. Pretty much everything is taken care of and you can be using VSTS within minutes of signing up. However apart from being able to choose from a couple of datacentres you don't have the same control over your data as you do with TFS. Of course VSTS is secure but if the nature of the business you are in puts restrictions on where your data can live then VSTS may not be an option. In terms of features it's a mixed story. VSTS gets new features about every three weeks and TFS eventually catches up a few months later -- as long as you upgrade of course. However VSTS is missing some components that are present in TFS, notably reports (as in SQL Server Reporting Services, although Power BI looks like it will fill this gap) and SharePoint integration. It's trivially easy to get started with VSTS and the first five users are free, so there is almost no reason to not give it a try. The process is described here and within minutes you'll have your first project created. I'll be covering connecting to and working with projects in the next post in this series but if you can't wait I'll tell you now that I'll be using the Scrum process template and choosing Git for version control. Create a VM in Azure. I opted for a Standard DS4 VM running Windows Server 2012 R2 Datacentre which I created in my PRM-CORE resource group as PRM-CORE-TFS using the previously created storage account and virtual network. Configure a few Windows settings. The first part of Ben's guide covers installing Windows but you can skip that as it's taken care of for us by Azure. The starting point for us is the bit where Ben describes configuring a new server. One part you can skip is the Remote Desktop configuration as that's already set up for Azure VMs. Install pre-requisites. Nothing much to comment on here -- Ben describes what's required with excellent screenshots. Install SQL Server. Choose the latest supported version. For me this was SQL Server 2014 with SP1. Install TFS 2015. Choose the latest version which for me was TFS 2015 with SP1. Be sure to create (and use!) the three domain accounts for the different parts of TFS. For me this was PRM\TFSSERVICE, PRM\TFSREPORTS and PRM\TFSBUILD. Make sure to check the User cannot change password and Password never expires settings when these accounts are created in Active Directory Users and Computers. Go with Ben's advice and skip setting up SharePoint. It's not critical and is an extra complication that's not needed. One point to be aware of when installing TFS on an Azure VM is the installation wizard might suggest the D volume as the place for the file cache (D:\TfsData\ApplicationTier\_fileCache). This is a very bad thing on Azure Windows VMs as the D volume is strictly for temporary storage and you shouldn't put anything on this volume you aren't willing to lose. Make sure you change to use the C volume or some other attached disk if that's the route you've gone down. Install Visual Studio 2015. Ben's guide doesn't cover this, but the easiest way to ensure all the components are available to build .NET projects is to install VS 2015 -- obviously the latest version. I'm not sure if it's strictly necessary on build servers but I always licence VS installations (Help > Register Product > Unlock with a Product Key) just in case bad things happen after the 30-day trial period expires. Another post-installation task I carry out is to update all the extensions from Tools > Extensions and Updates. In reality this just opens the Team Portal Control Panel at the Agent pools tab. From here you need to deploy a Windows build agent. The details are described here and it's pretty straightforward. In essence you download a zip (that contains the agent plus a settings file) and unzip to a permanent location eg C:\Agent. Run ConfigureAgent.cmd from an admin command prompt and respond to the prompts (TFS URL will be similar to http://prm-core-tfs:8080/tfs and you want to install as a Windows Service using the build credentials previously created) and you are done. If you chose default settings you should end up with a new agent in the Default pool. Since you'll almost certainly be needing the services of Nuget.exe it's a good idea to make sure it's at the latest version. Open an admin command prompt at C:\Program Files\Microsoft Team Foundation Server 14.0\Tools and run Nuget.exe update -self. 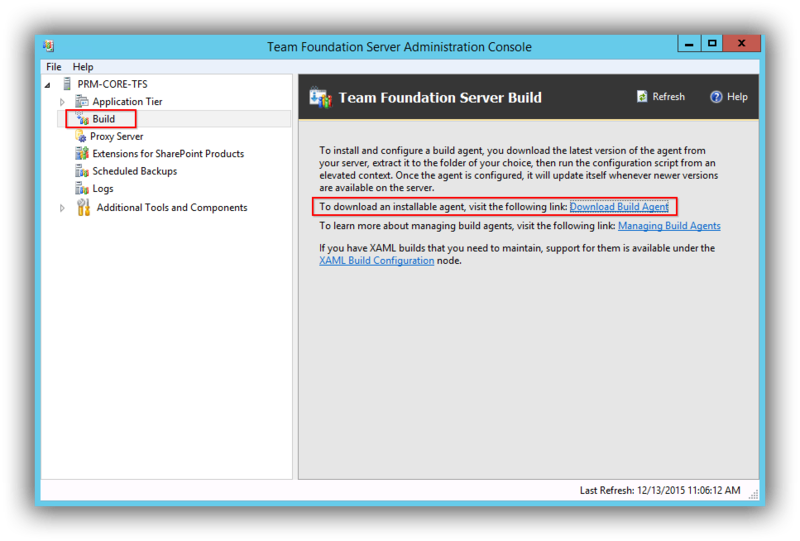 Compared with VSTS, setting up TFS was quite a bit of work -- several hours including all the installations and updates. Much of this activity will of course need to be repeated at every update. Not everyone will be able to go down the VSTS hosted route but if you can it could end up being quite a time saver. 9/1/2016 -- Updated with type of VM to reflect adoption of premium storage and expanded installing TFS build instructions.